We vaguely made plans and bought tickets from Kuala Lumpur to Đà Nẵng. Raina and Selvi live in Jakarta and I in Bandung, and we thought when the time was near, we'd book a ticket to KL. 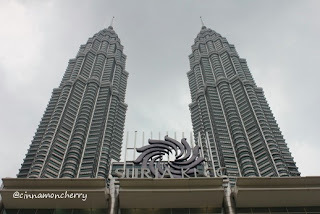 We kept changing plans, and finally we decided that we'd spend a couple of days in KL. That way, we'd have chance to explore and relax before tackling Vietnam. What to visit in KL? 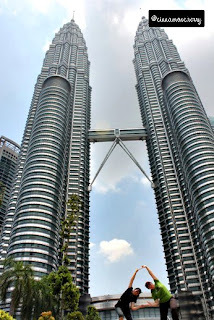 Naturally, we just had to go to Menara Petronas. We took Light Rail Transit (LRT) to a station that was supposed to be located near Menara Petronas. And... we still got lost. Ha ha. You'd think that with towers that high it'd be a piece of cake. Not so, apparently, for Raina and yours truly. We asked around and finally... we were there. Raina and I took some pics, and we found a couple of tourists kind enough to take our pics together. We soon found out that they perhaps had a hidden wish in becoming stylists, and they kept urging us to pose. Raina and I decided to do a fusion pose and they were very thrilled. "Where did you two get the inspiration to do that?" they asked. Raina and I exchanged glances and laughed. What else to do in this area? We visited the park and then the nearby mall. It was scorching hot so we did not feel like exploring much. But we did spend some time in Kinokuniya... aiyaa... not good for our pockets!